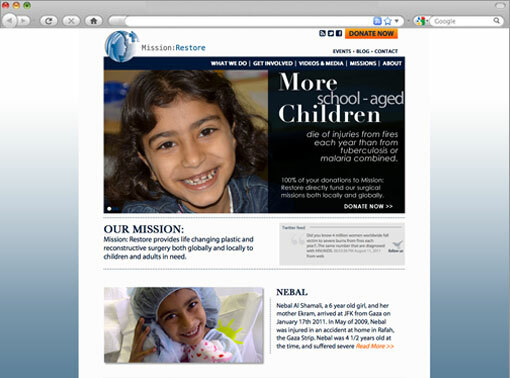 Mission Restore is a Nonprofit organization started by surgeons at the Long Island Plastic Surgery Group. These doctors recognized the need for extensive help providing plastic surgery in the developing world. The organization had lead two trips to developing countries and completed numerous surgeries abroad, and two cases so severe the patients were brought to the U.S. for treatment, yet they had no website. Mission Restore came to Studio K&M to create a site that would allow donors to learn more, share information about the organization with friends and find out all the ways they could donate and get involved. We created a site that would draw users in with alarming facts and eye-opening stories. It was very important that users understood exactly what makes Mission Restore stand out and to know exactly who the organization helps. We used straight forward architecture and kept our templates to a minimum to stick to their small budget.